Charlie Evans, president of the Federal Reserve Bank of Chicago, is flanked by Lake Forest-Lake Bluff president-elect Tim Newman (left) and current president Chris Webb. Photo submitted by Bob Kenehan. 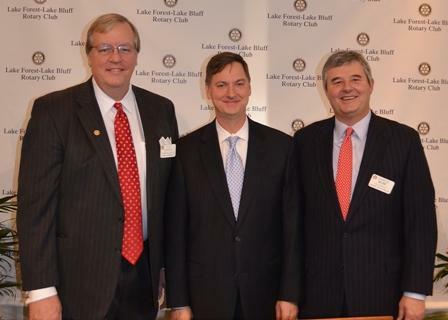 Charles Evans, president of the Federal Reserve Bank in Chicago who also sits on the Federal Open Market Committee which sets monetary policy for the country, spoke Wednesday morning in front of more than 200 people at the Lake Forest-Lake Bluff Rotary meeting at the Lake Forest Club.